A manual activation device for activating a starter assembly. The present invention may include a push rod that is connected to a solenoid plunger. The starter may be activated manually by pushing the rod and thereby pushing the solenoid plunger into the gears. Therefore, if there is an electrical or mechanical malfunction with the starter or the vehicle, the push rod may be pushed in to start the vehicle. If the battery is low it will still start.direct current straight to the battery,it bypasses all the electrical.and it has a lock on it.this is also a anti-theft device.and a diagnostics tool.it works on auto,motorcycles,hilo,bulldozers and all heavy equipment,boats and military equipment. 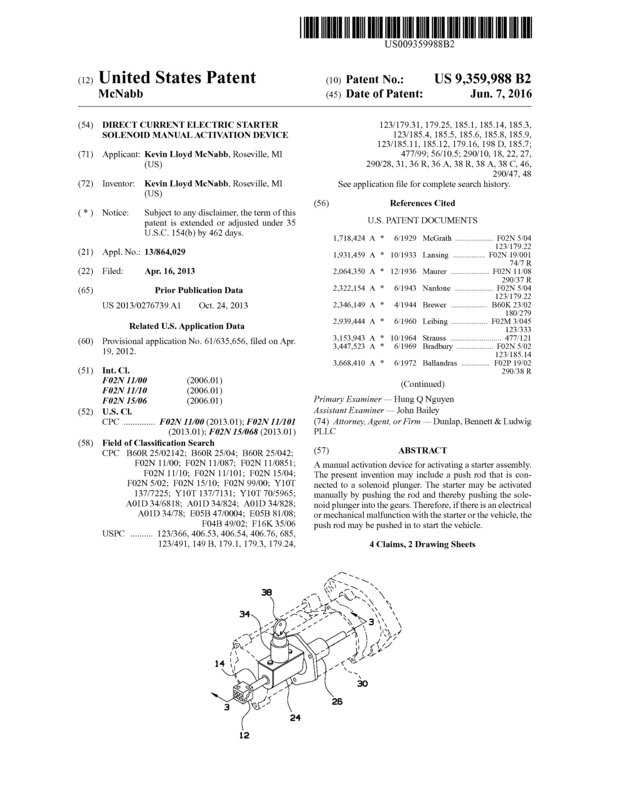 Page created at 2019-04-23 6:08:16, Patent Auction Time.